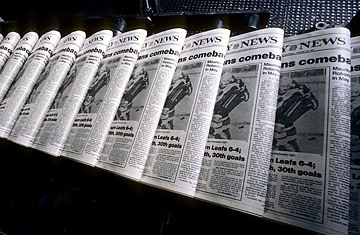 New York Daily News newspapers roll off the printing press. The newspaper industry is in a bad spot. Actually, run a correction on that statement  newspapers are in a "time to panic" spot. The business model is collapsing, ad dollars are disappearing, newsprint prices are at a 12-year high and the Internet is just giving news away for free. On July 2, the Los Angeles Times announced it was cutting more than one-sixth of its newsroom staff; the Tampa Tribune said it would cut 20%. Some weeks ago, Randy Michaels, COO of the Tribune newspaper group  the second largest in the nation  mused in a conference call with investors that while the company's salespeople were judged by their performance, "nobody has ever said, 'How many column inches does a journalist write?'" The problem is, productivity quotas are anathema to one of journalism's core duties, investigative reporting  an expensive enterprise that can consume months of a writer's time and often yield few results. With money at major news organizations tightening, editors and publishers are being faced with an uncomfortable question: who is worth keeping, the reporter who works on six hard-hitting pieces a year or the one who produces on a daily basis? Enter Pro Publica, a non-profit news organization devoted solely to investigative journalism and funded to the tune of $10 million a year by California-based philanthropists Herb and Marion Sandler. With a staff of 18 journalists (10 additional reporters have yet to begin), the group hopes to release their stories for free through exclusive deals with major media outlets such as the New York Times, The Atlantic and 60 Minutes, among other potential partners. On June 22, its first major story  about Al Hurra, a U.S.-funded Middle Eastern TV network that has broadcast anti-American propaganda  aired in conjunction with the famed CBS news program. Such an approach has already been criticized by the Miami Herald's Edward Wasserman, who inquired July 7, "why was Pro Publica using its philanthropic funding to, essentially, subsidize the cost of a segment for 60 Minutes, the most financially successful news show in the history of U.S. Television?" Pro Publica responded that its aim is to maximize each story's impact, which will involve hooking up with big name outlets. The group's purpose  as corny as it sounds  is to produce those increasingly rare stories that possess "moral force," according to editor-in-chief Paul Steiger, who spent 16 years as managing editor of the Wall Street Journal. "We're going to try to do stories such that, by shining a light on an abuse of power, we'll give the public the information it needs to effect change," he says. Such statements make Steiger sound like the most idealistic 66-year old around, a fact he acknowledges. "This is the first time in a long time that I've gone to work with butterflies." If Steiger is feeling butterflies, journalism must have something Mothra-sized flapping in its collective stomach. According to the American Society of Newspaper Editors, last year daily newspapers experienced the largest decrease in their workforce in three decades. In the same year, The Newspaper Association of America reports that newspapers experienced their most severe decline in ad revenues in more that half a century. Steiger, who has been in the business for 42 years, puts it starkly. "What's going on in the news business is a lot like what's happening with music," he says: free distribution of content over the Internet has created "a total collapse of the business model." For Pro Publica, one answer to the problem is to give news away for free  fulfilling the lofty ideal of journalism as an essential public service. It's not unlike what nonprofit entities like NPR, PBS and CSPAN  as well as journalism organizations like The Center for Public Integrity and the Center for Investigative Reporting have been doing for decades. But with most of Pro Publica's assets the product of the Sandlers' largesse, it leaves the group open to speculation, as Slate media columnist Jack Shafer pointed out, that the Sandlers political views could influence coverage: the couple have donated heavily to the Democratic Party and the progressive activism group MoveOn.org. "The perennial problem of nonprofit journalism is the appearance of undue influence," says Christa Scharfenberg, associate director at the Center for Investigative Reporting. "The real danger of having just one or two major funders is that all of your reporting gets evaluated through their political leanings." Herb Sandler dismisses such concerns. "We would destroy this thing if we were to interfere," he says. "We totally understand that this will be a failure unless it's totally independent and we're not into supporting failures." Yet for Pro Publica to be considered a success, it will need to prove it can sustain a track record of high-profile, high-quality journalism and that it can survive past the Sandlers' initial three-year financial commitment. Such an achievement could create opportunities for more philanthropy-supported journalism. As Duke University economist James T. Hamilton puts it, "Newspapers used to be owned by people who were willing to trade off profits for the notion that they were doing the right thing." And with profits disappearing, doing the right thing is becoming increasingly important.